Disregard for the past will never do us any good. Take a moment to ponder on the following question: If you were able to travel to any point in history, knowing that you could safely return to this moment in time, where would you go? What historical event or place would you like to observe? I have often asked entertainers, especially new entertainers, this question as part of a personal ritual to get to know the individual. Majority of the entertainers respond with the birth or the crucifixion of Jesus Christ. I had one entertainer say the signing of the Declaration of Independence and another say the landing on the beaches of Normandy during D-day. Whatever your answer may be, just ponder over all of the events that took place in history and consider which one interests you. One of the most atrocious situations that is occurring right now is taking place in our public school systems. The situation is the lack of teaching history. Back in the day, History class was one of the main staples of public education. Now with the introduction of courses that should be taught at home, history class has been placed on the back burner and even deleted from the curriculum. Without history, there would be no future. Consider and contemplate on the above statement for a moment. It’s an amazing statement that inspires such a vast display of consideration, deliberation and understanding of the world around us. Without history, there would be no future. In the valleys of Chota, the capital of the Cherokee Nation, lies a camp of Cherokee Indians. The year is 1738 and their nation is in what is now eastern Tennessee. Their teepees are gathered together which shows a close knit community. It's early morning and the dew is still upon the blades of grass, when a scream is heard from one of the teepees. A child is born. At that same moment, among the horizon a white wolf appears. Members of the tribe know, that this child is a child of peace. For the white wolf told them so. The child's name is Nanyehi, which means “she who walks among the spirit people.” Nanyehi was born in to the Wolf Clan, one of the most prominent of the seven Cherokee clans. In 1755, Nanyehi accompanied her husband, Kingfisher, to war against the Creek Indians in the Battle of Taliwa. Nanyehi, knelt beside her husband, chewing the bullets to make them more deadly. During the battle Kingfisher was killed. In honor of her husband, Nanyehi picked up his rifle and led the Cherokee to victory. She was honored as a “War Woman” and was given the right to sit on the War Council, and deemed the leader of the Women's Council. She was granted power, that even the Chiefs didn't have. In her position, she could determine the fate of captives, whether they be killed, enslaved, released, or adopted into the tribe. Nanyehi went on to use her powerful position of War Woman to promote peace between the Cherokee and the white settlers, the British, the French, and other tribes. After years of leading her people, tending to the wounded and caring for the many orphans; she was elevated to the highest position a woman could have, that of “Ghigau,” or “Beloved Woman.” She was given a shawl of white swan feathers, which remained a symbol of her authority for the rest of her life. She met her second husband, Bryant Ward, who was a trader in Cherokee country of Irish descent. She became known as “Nancy Ward” to the American settlers. Nancy Ward played one of the most important roles in American History. Nanyehi entered the spirit world in 1822. Witnesses say that a white light rose from her chest, swirled around the room, took the form of a swan, and flew out the window toward her beloved Chota. As a direct descendent of Nanyehi, Hobbs unquestionably wanted to share the story of her 5th Great-grandmother. 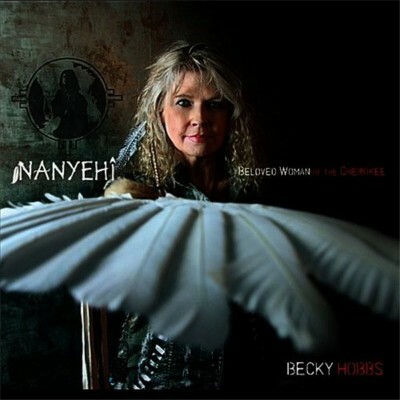 Hobb’s journey has led her to release a beautiful album, Nanyehi: Beloved Woman of The Cherokee, in 2011. The seventeen cut album tells the story of Nanyehi from birth through to death, with the use of song. This album was produced to coincide a world class musical. Hobbs teamed up with Nick Sweet to create a beautiful interpretation of Nanyehi’s story. The World Premier performance of Nanyehi: Beloved Woman of The Cherokee opened in Hartwell, Georgia, in April 2012. The six show run was embraced by sold out attendance with standing ovations. The show continued the following year with four performances at the Northeastern State University in Tahlequah, Oklahoma. In 2014, the show received raving reviews as it was presented eight times a The Kingsport Renaissance Art Center in Kingsport, Tennessee. The show continued with three more performances at The Joint, Hard Rock Hotel and Casino in Tulsa, Oklahoma. The show will return to Tulsa for a fourth run in 2015. Dates for the show are scheduled for November 5, 6 and 7; with auditions slated for September 19 & 20. For more information about the show please visit www.Nanyehi.com. Adjacent to the Nanyehi musical, Becky has been very busy. In October 2015, the Oklahoma Music Hall of Fame will induct Becky along with Restless Heart, Tim DuBois, Scott Hendricks and Smiley Weaver. The event will take place on October 16th at the Muskogee Civic Center in Muskogee, Oklahoma. Hobbs also joined the Daughters of The American Revolution (DAR) back in June. On September 18, 2015, Becky Hobbs will join myself and my co-host Jack during a live show of Strictly Country’s Friday night radio show - Around The Campfire. On the show, Hobbs will tell us more about Nanyehi, Nancy Ward, and the musical. We will also feature songs from the album Nanyehi: Beloved Woman of The Cherokee. Becky will also give away an autographed copy of the album to one lucky listener. Interesting parties can listen to the show beginning September 18th through September 25th on our website at: www.Strictly-Country.com, lower right hand corner of the home page. Listen to the show to hear how you can register to win the autographed copy of the album.